JFK meeting with Andrei Gromyko in the Oval Office on October 10, 1963. 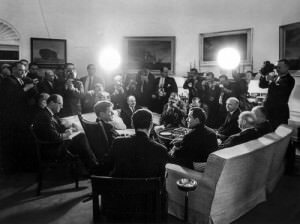 For whatever reason, JFK didn’t tape his famous meeting with Soviet Foreign Minister Andrei Gromyko on October 18, 1962, during the Cuban Missile Crisis. But nearly a year later, he did tape another Oval Office meeting with Gromyko. It was less than six weeks before Kennedy was assassinated, and the two ranged over major current issues in Soviet-American relations. The Soviet troops in Cuba was a major point of discussion. More generally, Kennedy emphasized an improvement in relations over the past year, and pointed particularly to his American University speech in June as a blueprint for his approach. At over two hours, it was a long meeting. And the two did not meet alone. On the U.S. side: Secretary of State Dean Rusk, Ambassador-at-Large (and resident Kremlinologist) Llewellyn Thompson, Assistant Secretary of State for European Affairs William Tyler, and interpreter Alexander Akalovsky. On the Soviet side: Deputy Foreign Minister Vladimir Semenov, Ambassador to the United States Anatoly Dobrynin, and translator Mr. Sukhodrev. The official American memcon (memoranda of conversation) is also long and consists of eleven parts. Here’s the section that corresponds to the segment of tape transcribed below. As you can see, the memcon catches the highlights, but there are important points of nuance that it misses. JFK’s mention of Cuba in the 1964 campaign is particularly notable. JFK Well, thank you, Mr. Minister. Well, we-- I appreciate what you said. We have attempted to carry out a policy, particularly in the days since--at the American University and since then-- the American University [speech] expressed my view of our relations. As I said yesterday at the press conference, there are areas of disagreement, but in my opinion there are none that need lead us into a direct collision. And I think it's up to the Chairman and me and our two governments to prevent any matter on which we may disagree. Looking at the world and . . . I think that we should be able over the next months to have satisfactory relations. I think the question of Laos concerns me, but I know that-- I know the Soviet Union [unclear] is attempting to meet its agreements in [unclear: creation of?] Laos to prevent that situation from collapsing. The question of Cuba, which is of great concern to us here and will be of more concern as 1964 and the presidential elections come along will be more and more discussed. The fact that these reductions of forces which have taken place are very helpful, have lowered the tension a good bit. And I hope that it's possible that they could continue. The United States [unclear] has no intention of invading Cuba, and as these troops leave it reduces the international significance of the Cuban-Sino-American [sic] dispute into a matter of longer range and more traditional form. So that's helpful as these forces leave. I hope that it could be continued as the months go on because it is a matter which [unclear: microscopically?] make speeches about it. On the question of Germany, it may not be possible for us to concretize our positions. But as a de facto matter, it seems to me, we can . . . the situation should be satisfactory. I don't--as I say, we're not-- I don't see any reason why there should be an incendiary atmosphere arising over Berlin. We want to prevent any incidents at the corridor as much as we can because they're annoyances, which I'm sure the Soviet Union with its great power doesn't need to have these kind of annoyances. If you're going to have difficulty it would be over something major but not over whether you get 24 men on bus or 31. So I would say, Mr. Minister, that American policy is, as it was stated in the American University speech, which was really directed to the American audience more than the Russians, such that it would be for us to attempt, as a matter of, to solve our differences in a peaceful way. That's what we're going to continue to do. And we appreciate the fact that you have stated-- the Chairman has stated-- that that's your intention. Draft transcript by David Coleman. Tape 115/A51 reel 3, Presidential Recordings Collection, President’s Office Files, John F. Kennedy Library. 1. Akalovsky, “Memorandum of Conversation,” 10 October 1963, in FRUS 1961-63, 5: doc.363.